The Drill Drain filter nail is a system that utilises the TITAN 40/27 to inject a filter material with the optimum permeability coefficient, allowing slope dewatering. The control of slope seepage water reduces hydrostatic pressure, whilst retaining the positive soil properties. 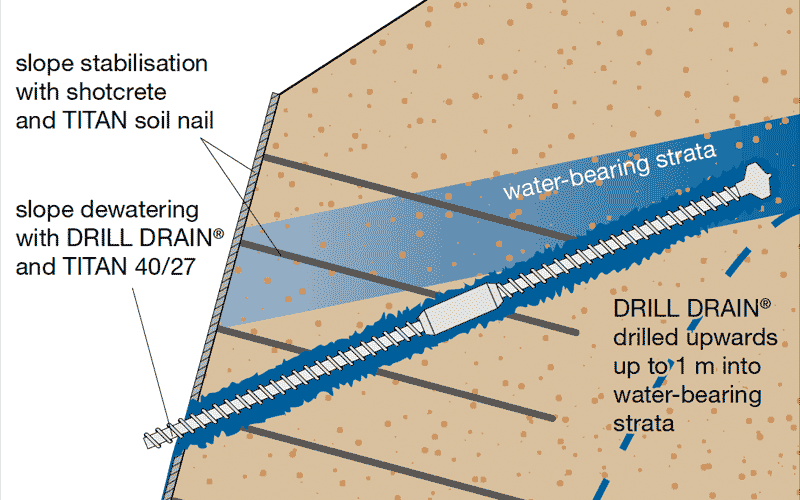 The Drill Drain is installed upwards into the slope, drilling up to a meter into the water bearing strata. The system allows a reduction in pore water pressure whilst maintaining the soils properties.